Do you have a “gummy” smile? Do you feel like you have more gums than teeth? 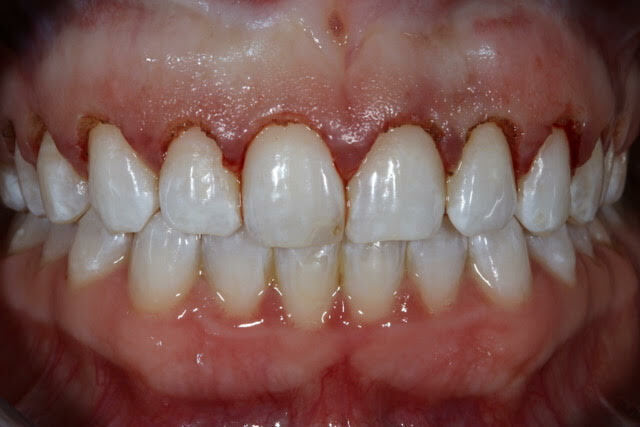 A “gummy smile” or gingival overgrowth is when during a natural smile you show at least 3 millimeters or more of gums at the zenith of the tooth (the top of the arc where the teeth meet the gums). This condition can be caused by genetics, hormonal imbalances, poor oral hygiene or poorly-fitting dental work sitting at or below your gumline. How do you get rid of a gummy smile? Dr. Justin Russo takes a complete cosmetic approach to smile makeovers and restoring a youthful, vibrant smile. 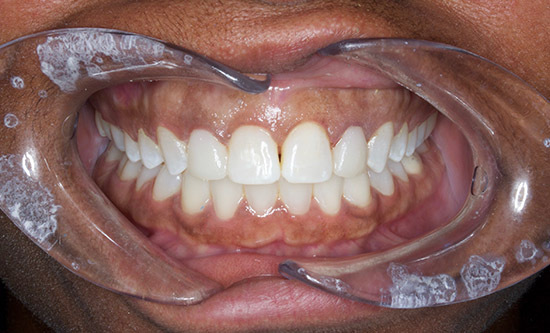 Dr. Russo sees a smile as simply a balance of teeth and gums, framed by the lips and face. Achieving the appropriate balance of teeth and gums are important to achieve the most youthful cosmetic look. 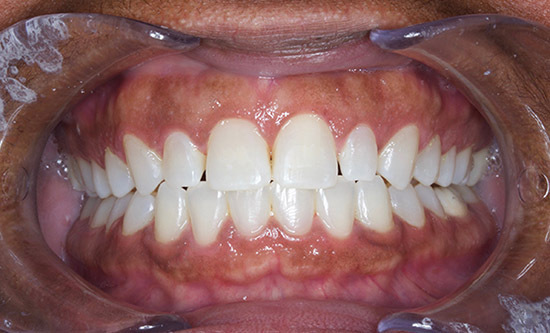 Gums that are uneven or show too much when you smile can make your teeth look small and, in some cases, patients may feel a gummy smile may look less attractive. Raleigh’s top-rated cosmetic dentist and smile artist Dr. Justin Russo is trained to recognize all types of uneven gum contours and gingival overgrowth contributing to a “gummy smile”. 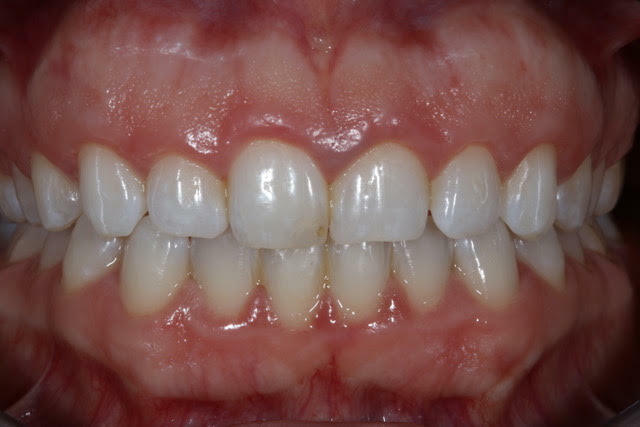 In some patient cases, Dr. Russo uses his diode laser to lift and sculpt your gums to restore symmetry and beauty. Typically, Dr. Russo performs corrective laser gum lifts during smile makeovers with porcelain veneers and crowns, to achieve the ultimate transformation to beauty. Laser gum lifts can also be performed as stand-alone procedures to reduce your “gummy smile”. Dr. Russo is proud to offer this service with minimal bleeding and discomfort and in almost all cases with local anesthetic. The best part? Dr. Russo’s total procedure time is usually 15 minutes or less. If you feel like you are showing a little too much gum when you smile, give Dr. Russo a call today to find out if a laser gum lift is the right treatment for you to enhance your smile! Call (919) 890-5147 or click here to request an appointment online. 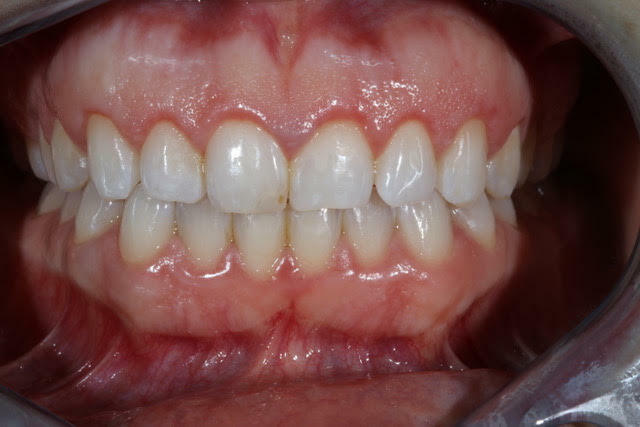 The photos below show before, during, healing and after a patient gum recontouring procedure. Also includes Veneers on lateral incisors.